"A poised and communicative artist." "With a voice of quality, she performed dazzling florid passages." "A joy to hear! She performed with a rich timbre, rhythmic control and a sense of theatrics with excellent diction." "Miss Bradley's arias were the high point of the entire evening. She had flawless phrasing and exceptional breath control and was a model of vocal articulation." "Bonnie Bradley has a dazzling but controlled technique with a rich and beautifully trained voice." "Bonnie Bradley proved to be one of the most sensational mezzo-sopranos and is one of the best-trained singers you will ever hear. She is among the finest examples of really fresh, scintillating voices." "In the castrato role of Sextus, Bonnie Bradley negotiated her big Act I aria with skill, ornamenting and trilling her repeats." "Miss Bradley is a rich-voiced mezzo who was entirely at home on stage." 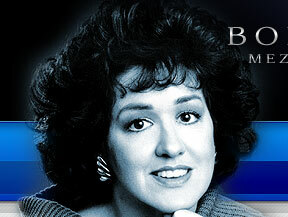 "Mezzo-soprano Bonnie Bradley sang with a robust richness of voice that showed a mastery of range and control. Her Act 1 aria was sung with such ease it belied the intricacy of the music." "In a wide-ranging and satisfying program including Purcell, Mahler, Satie and Ives, she seemed to know exactly what every song was about and how she intended to interpret it. Some of Miss Bradley's most rewarding singing came in such lyrical selections as Ives's "Songs My Mother Taught Me," in which she skilfully shaped and sustained the long phrases. And she threw herself into Rossini's "Bel Raggio Lusinghier- from "Semiramide," with plenty of exuberance as well as an impressive command of the difficult fioriture. Her diction is excellent and she cares about the words."